Record-setting rainfall in 2018 has resulted in moldy hay and feed throughout the Commonwealth. Many questions regarding the safety of these feedstuffs and how to test them have come to the UK Veterinary Diagnostic Laboratory (UKVDL) as producers begin to feed these moldy products. While mycotoxins (mold poisons) are the main concern, molds themselves can adversely affect health and productivity of cattle. Ingestion of moldy feed or hay can potentially cause mycotic (fungal) abortion, respiratory effects, decreased feed consumption and rate of gain, and digestive problems. Additionally, molds can have effects on humans that handle the moldy feed. A wide variety of mycotoxins, not all of which can be tested for, can be produced in moldy feeds and hay under the right conditions, and ingestion of sufficient amounts of various mycotoxins can result in a large array of clinical effects. Testing is recommended but proper sample collection is crucial as samples must be representative of the whole field, cutting or batch. Although there is no foolproof approach to avoiding health effects, a practical approach involves testing suspect feeds in the ration, avoiding moldy feed if possible, and dilute with clean feed to minimize effects. The presence of considerable mold in hay is a fairly common occurrence but when is too much mold a problem? Several laboratories have the ability to run mold spore counts (reported in mold spore count per gram) to help quantify the extent of mold present. 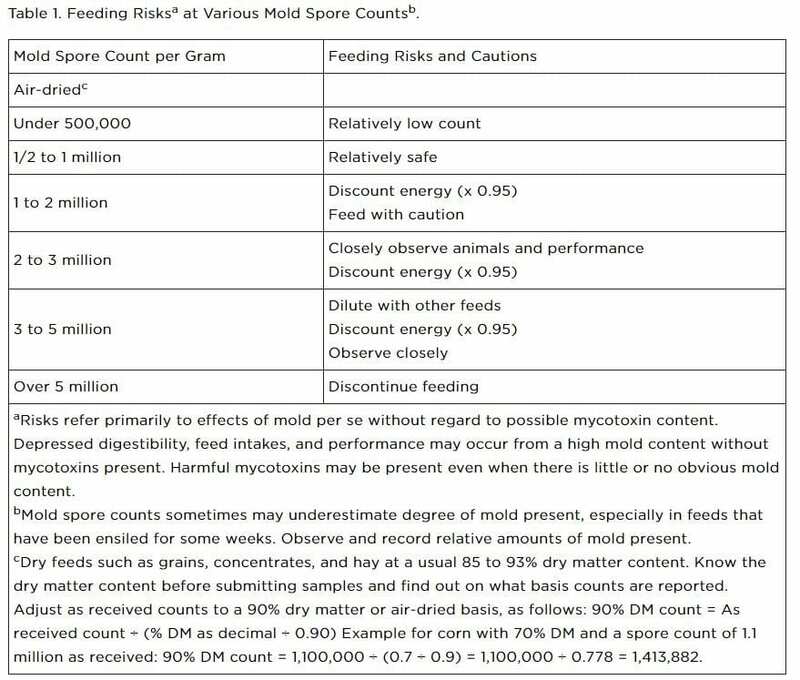 Recommendations from Penn State Extension (https://extension.psu.edu/mold-and-mycotoxin-problems-in-livestock-feeding) regarding feed risks with various mold counts are presented in Table 1. Generally, moldy hay is less palatable and digestible, resulting in less intake and lower performance. More serious health effects include the potential for fungal abortions and respiratory problems. Fungal or mycotic abortions usually occur in the last trimester of gestation and are directly related to consumption of molds which enter the blood stream and infect the placenta and fetus. An allergic respiratory disease known as “hypersensitivity pneumonitis” or “bovine farmer’s lung” is caused by exposure to the dust of moldy hay and grain. The disease is characterized by groups of cattle exhibiting coughing, rapid or difficult breathing, and weight loss but there are very mild or no fevers present and no response to antibiotic therapy. Humans who handle exceptionally moldy hay may also develop a type of allergic reaction called “farmer’s lung”. Although molds are present in the environment virtually at all times, when they grow in the correct temperature and humidity on the right substrate, they can grow and produce a “toxin” or poison. Mycotoxins are naturally occurring compounds produced by fungi growing on plants in the field or during storage periods. While drought conditions generally lead to an increased risk of aflatoxin in grains, wet conditions tend to favor the production of fumonisin. In the right environment, mycotoxins can be generated fairly rapidly in the field or in storage but suspect molds do not always produce them. Most mycotoxins can remain stable for years in feeds, and many survive ensiling and food processing. They can be concentrated in cereal by-products including distillers coproducts. Aflatoxins can occur before harvest on starchy cereal crops (corn, cottonseed, and peanuts) or after harvest while in storage. Strains of Aspergillus flavus mainly produce aflatoxin B1, which is considered the most toxic and cancer-causing of the aflatoxins. Many governments regulate the allowable concentrations of aflatoxins in animal feeds, human foods, and fluid milk. The FDA limits the amount of aflatoxin that can be found in lactating dairy cow feed to 20 ppb, for non-lactating, breeding beef cattle is 100 ppb while feed for feedlot cattle may contain up to 300 ppb. Aflatoxin M1 is the major excretion product in urine and milk and is the one most often monitored for exposure. Aflatoxin M1 is legally limited to 0.5 ppb in milk. Extremely high levels of aflatoxin B1 (>1000 ppb) may cause sudden or acute neurologic signs such as circling, depression, staggering, recumbency and death due to severe liver and brain damage. Veterinarians and nutritionists must consider all sources of aflatoxins in rations and evaluate commodity storage conditions on the farm. It is important to sample the final as-fed ration to determine the total level of aflatoxin the animal is consuming. Sampling is best performed when feed is moving (for example, from the grain bin to feeding) to allow multiple samples to be taken along the line. No specific treatment is available for aflatoxicosis beyond quickly removing the contaminated ration and replacing with an uncontaminated feed. Providing optimum dietary protein, vitamins, and trace elements may aid recovery, although some affected animals may not recover. Numerous products such as bentonite are marketed to sequester or bind mycotoxins and reduce absorption from an animal’s gastrointestinal tract, although in the United States these agents can only be sold as anticaking or free-flow agents. The FDA has not licensed any product for use as a mycotoxin binder in animal feeds and extra-label use of feed additives is prohibited. Other mycotoxins of concern in cattle are those produced by the Fusarium species of mold and include deoxynivalenol (DON or vomitoxin), zearalanone, and fumonisins. Ruminants are generally resistant to many of the negative effects of these mycotoxins because of their ability to degrade these compounds with the bacteria and protozoa found within the rumen. However, in large enough quantities, serious effects may occur. DON is restricted by the FDA to 5 ppm or less in the final ration of dairy cattle over 4 months of age, and 10 ppm in the final feed for beef cattle over 4 months of age. The primary clinical sign with DON is feed refusal but a drop in milk production, diarrhea, and immune system alterations may be noted. Zearalanone is associated with hyperestrogenism, enlarged genitalia and infertility although the effects in cattle are not fully understood. No FDA guidelines have been established for tolerable zearalenone concentrations in finished feed for ruminants. 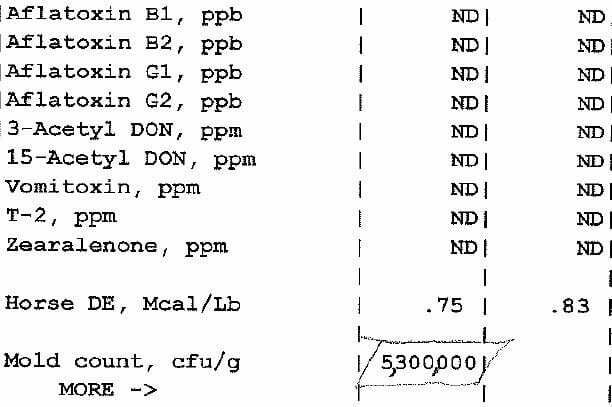 The University of Missouri at Columbia and North Dakota State University suggest limiting the level of zearalenone to <2-4 ppm in dairy cows and <5-10 ppm in beef cattle. Fumonisin B1 and B2 are mycotoxins cattle are more tolerant of than many other species. The FDA does have established tolerance levels of total fumonisin levels in finished feeds of 30 ppm for ruminants over 3 months old and fed for slaughter, 15 ppm in ruminant breeding stock including lactating dairy cows, and 5 ppm for ruminants less than 3 months of age. Feeding large quantities has resulted in decreased feed intake, decreased milk production, and some mild liver lesions. FDA regulations concerning the various mycotoxins are rather inconsistent, with some tolerances established only for grains and grain by-products but not for the final feed, and others established for the final total feed. Also, some tolerances are reported on an 88% dry matter basis, while others on a full dry matter basis. Keep the mycotoxin level under the regulatory action level for the given species and stage of production as aflatoxin residues can occur in multiple animal products from animals exposed to excessive amounts. Residues are especially important in milk and organ tissues, but can also be present in meat. Remember if multiple mycotoxins are present in a feed, their adverse effects may be additive. Figure 2: Example of laboratory result on grass hay analyzed for mold and mycotoxins. “ND” is not detected. Proper sample collection is crucial for proper interpretation of results. Collect a number of smaller samples to form a large composite sample that is representative of the field, cutting, or batch. If different regions of the field were treated differently, then separate composite samples should be submitted for each of the different regions. At least a pound of total composite sample should be submitted. The sample represents a large amount of feed so it is critical that the sample is representative of the whole. More sample is always better than too little, so when in doubt, collect more. Fungal growth could continue during storage increasing mycotoxin levels over time so retesting may be necessary. Be sure to mark each bag legibly with forage/sample type and identification information. See http://vdl.uky.edu/LaboratoryServices/Sections/Toxicology/Feedsandforagesspecimencollectionguidelines.aspxfor more information on proper sample collection of feeds and forages. 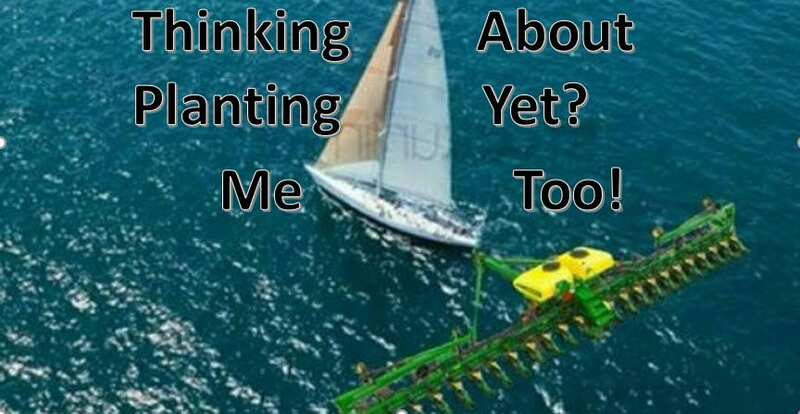 Posted by Sabrina at 3:29pm Posted in Livestock. Bookmark the permalink.